The first sweater I ever made was a disaster. I followed a pattern that I'd found in Elle Magazine (a hundred years ago; do they even still do knitting patterns? ), and I followed it precisely and accurately. It was kind of a modern fisherman's sweater - knit in a lanolin rich unbleached white wool, but without cables and pompons. Instead it was mostly seed stitch, in a big V, with plain knit below, and rolled edges at the neck and hem. The problem was the seed stitch - it had way too much give in it. The give, coupled with the weight of the wool, meant that the sweater looked like an enormous potato sack on, and so I never actually wore it. I thought about it a lot; after all, I'd put a lot of time into it, not to mention yarn. I thought about intentionally shrinking it, I thought about reinforcing the shoulder seams with twill tape to combat the sag. Eventually, the sweater ended up at my mother's house - where everything in need of alteration would go. Every once in a while, I idly wondered to myself about its whereabouts - thinking perhaps I'd rip it out and make something else - and then I'd promptly forgot about it again. On Saturday, I found the sweater. I have never been so horrified in my life. Dirty stinking rotten moths. I've seen moth damage before, but usually a pin hole here or a nibble there. These moths ate great swaths of knitting - holes from the front ALL THE WAY THROUGH to the back. This, people, is not the kind of decay that is inadvertently lovely or whimsically elegiac. This makes me heartsick. Hah! That was my first sweater pattern too. I think I may still have it around here somewhere. Not the sweater, though. That is long gone. it is kind of fascinating to look at, though, like this. Yes. There is something very tragic about a moth eaten item of handmade clothing. 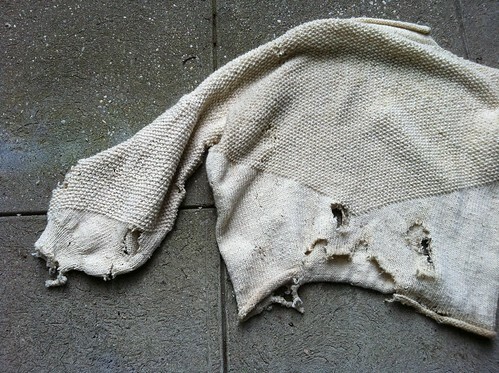 It looks like it had the potential to be a lovely sweater. I had a yarn stash with some lovely wools in it, beautiful, handspun, carefully storede in Ziploc bags to prevent moth damage. The the ex(before he was the ex)went rooting through my stash for something he thought was there (but wouldn't be, because I never mix stashes-yarn here, fabric there, paper in another spot)and rather than simply look at the Ziplocs and see that there was yarn in there,he opened them...and left them open, because apparently all the stern lectures about the dangers of wool-eating aliens went unheard. Moths got the lot, munching their way along balls and skeins, leaving me with a nearly infinite collection of tiny, albeit lovely, woolen stringlets. Sorry 'bout your sweater...I feel your pain. Even with the moth holes, I'm impressed with what you did. Oh, that stinks. Did you bring it home? Salvaging parts may have some emotional benefit. I'm dancing around the idea of starting a sweater....want to take one on with me (with the caveat that you'd have to do a heck of a lot of teaching)? !